I am not really aware of any books that deal with the history of George Allen before Sir Stanley Unwin bought the company, though there is a chapter in George Allen & Unwin: A Remembrancer. Does anyone have any other recommendations? Do you have any more info on "Rayner's 'Publishing Tolkien' from Thornton's" as I have not heard of this before? How much is Tolkien mentioned in these? Ardamir, not much mention of Tolkien in most of these books, only a couple of sentences apart from Rayner Unwin's George Allen & Unwin - A Remembrancer, which has a lot of information. 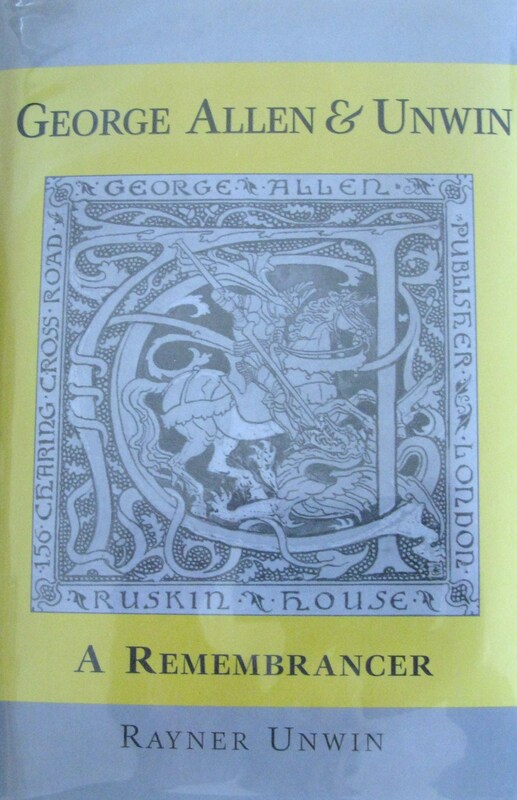 Anyone know where I could buy a copy of Rayner Unwin's George Allen & Unwin - A Remembrancer? It seems rather hard to come by. I would love to own a copy if anyone knows. I'm sure that Remy would not mind me posting extracts from the email that he received on the subject, from Merlin Unwin, publisher of the book. Thanks for your email. Alas, I am unable to help you with this request. My father’s book was printed in small numbers (I think 300 from memory) and it is rather frustrating that we under-printed slightly. I have looked into the costs of a small reprint and sadly it looks untenable for us – so really your best bet is to get hold of it from a library or possibly via www.abebooks.com. Hope this is of help and sorry we can’t supply you with your own copy. I have seen two copies for sale in the last five years, one on eBay (about three years ago) and one very recently on Abebooks (which was withdrawn from sale as it had been sold privately). It is also helpful to see what the book looks like so you can keep an eye out for it in second hand bookshops so I have attached a copy of the cover. The spine is also very distinctive in grey and yellow with "George Allen & Unwin" as the title. Good luck in finding a copy, it is an excellent book. It may be worth people who are interested in the book contacting Merlin, I see on his web site that he sells limited leather editions of books and I'd assume that if he produced a limited leather edition of this book there is a market of buyers readily available to buy the book (I'd buy a copy). It was produced by William A. Meeuws of Thorntons in 1992, in a very limited edition. My copy is no.27. We published the book you are asking about. It was written by Merlin’s father. We only printed about 250 copies which would explain why you have had so much difficulty in getting hold of a copy. Merlin has it in mind to try to get it set up on a print on demand basis and when and if this happens we will be happy to let you know. In the meantime I’m afraid the only option is second-hand booksellers. I got an automated email from Abebooks last week too. It arrived in my inbox at ~16:00; but when I went to the link (when I got in from work at ~17:30) it had clearly already been sold. Another email quickly followed this first one; it didn't contain an active link either --presumably sold very quickly. The printing numbers & history regarding Rayner's The Making of the Lord of the Rings produced by Wim is also quite complicated. I'm not sure if Wim can quite remember! My copy of The Making of the Lord of the Rings booklet is unnumbered, a later printing than garms, but I seem to remember that it was limited in some way. The information in the The Making of the Lord of the Rings booklet and the Remembrancer are very similar. The booklet is much easier to get hold of than the book as well and will fill in some of the information from the book. "As such, this is not quite a limited edition of 100 copies (There were one or two previous 'Limited' Editions). Thorton's are actually the publishers (Wim Meeuws) and the booklet is currently 'in print' and available. I believe there were two other limited edition print runs (One being 250 copies and the other 50). I am not sure which was the first print run (possibly the 250 print run). The current print run of 100 copies is not numbered. The earlier 250 print run is numbered on the back cover. I don't have one from the print run of 50 copies (if this exists - I belive from a previous conversation with Wim, that some/most/all of these may have been lost when he moved)." In addition there are also 12 copies bound in paper over boards which were printed in addition to the current 2007 Limited Print Run of 100. I also think that there may have been another 26 copies (Marked A-Z) in addition to the original 250 print run (same softcover binding as the original 250) - not 100% sure about this. As Khamul stated, it has a complicated printing history and there may well be another print run other than the ones I know about. And indeed, there are copies from the un-numbered 2007 Print Run of 100 still available for sale even now (on ABE and ILAB).